Batters for flat and for sweet wafers typically contain between 100 and 170 parts of water per 100 parts of flour (Tab. 1). Most of the water has to be removed during the baking process. A reasonably low viscosity of the batter and a uniform distribution of all the ingredients is essential for wafers with a homogeneous structure. The formation of gluten lumps during mixing due to “washing-out” of gluten, i.e. gluten agglomeration, can result in problems in the production up to standstill of the machinery due to blocked batter depositors and sieves, or in uneven browning, inhomogeneous structure of the wafers, missing edges and corners of the wafers and in reduced stability of the baked product. Therefore, the use of low protein flour or dilution of the protein by starch addition is very common but may not be sufficient to avoid problems. 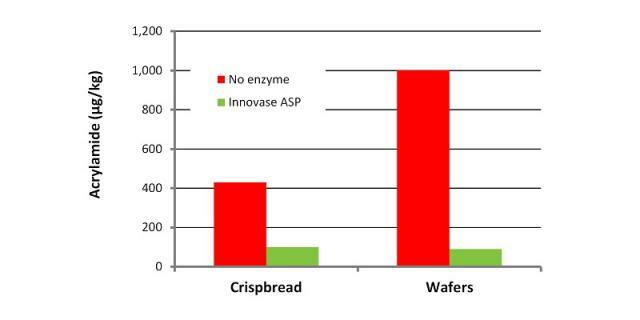 Proteases are the key enzymes for wafer production, since they degrade the protein and therefore avoid gluten aggregates. This function is shown in the lower curve in Fig. 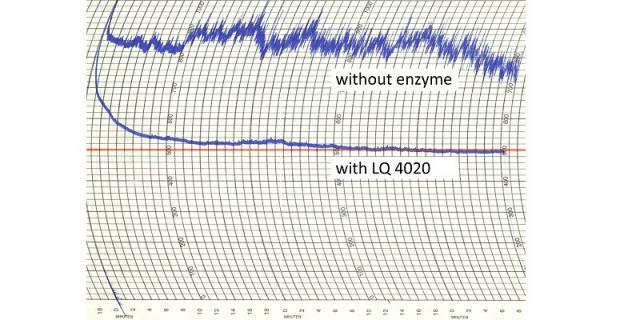 1, which is very smooth compared to the upper curve, where gluten lumpsor strands adhering to the permanently rotating mixing tool of the Amylograph caused a fluctuation of the mixing resistance. Wafers are baked as a thin layer between hot irons until the water content is below 3 % (and for better shelf life even below 1%). The amount of water to be evaporated is one of the important parameters to determine the required baking time at a given temperature. Furthermore, is has a direct impact on the energy consumption (see below). Whereas flour particles adsorb a portion of the water on their surfaces, proteins, damaged starch and pentosans are able to bind water as a gel. Enzymes releasing this water reduce the water addition required to obtain a desired batter viscosity, hence reduce baking time and evaporation energy. Gluten protein binds about 1.5 times its weight of water, intact starch less than its own weight, damaged starch approx. 2.5 times and water soluble pentosans about 10 times. Therefore, addressing the pentosans appears most promising, with regard to reduction of water absorption. In fact, pentosanases are very effective tools to reduce the viscosity of wafers batters. Nevertheless, it is worth to look a little bit closer to avoid surprises at the wafer line. There are two different classes of pentosan molecules in wheat flour, a water-soluble (extractable) fraction and an insoluble fraction, which – nevertheless – is suspended in water and hence accessible by enzymes. Pentosanases act on both fractions. Hydrolysis of the insoluble fraction results in smaller molecules, which are soluble in water and have a much higher water absorption capacity. In the early stages of pentosanase action (or at low dosages) this is the prevailing effect, as compared to water release from soluble pentosans, thus the viscosity increases (Fig. 3). At higher dosages or upon continued enzyme action, also those solubilized, previously insoluble pentosan molecules are broken down, resulting in a release of water from the gel and a reduction of the viscosity. The reduction of the viscosity of a wafer batter becomes visible in Figs. 1 and 2. Fig. 1 was obtained with flour and water mixtures, whereas Fig. 2 was prepared with flat wafer batters. In both cases, the use of wafer enzymes resulted in an immediate drop of the viscosity already in the premixing, followed by a period of limited viscosity change shown in the Amylogram. Fig. 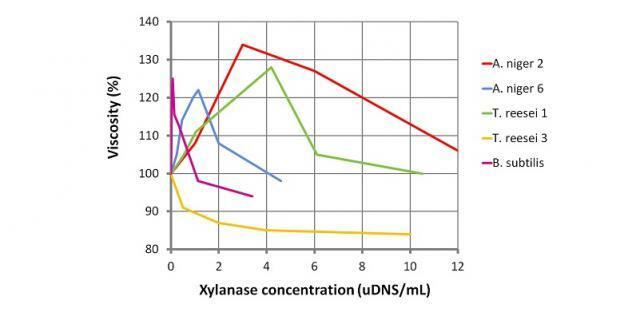 3: Effect of various microbial xylanases on the viscosity of a wheat pentosan suspension. Starch contributes approx. 70 % of the flour weight. Hence, a substantial amount of water is bound to the surface of starch granules and clusters, and mechanically damaged starch is also able to bind water in gels. Although alpha-amylase can hydrolyse starch gels reducing the water binding capacity, its use it not advisable. The enzyme produces dextrins (fragments of starch molecules) that may cause excessive adhesion of the wafer sheets to the irons. The enzyme also releases even smaller molecules such as maltose or maltotriose, which enhance the browning. Beta-amylase and glucoamylase only produce small molecules (maltose and glucose, resp. ), and they do not affect the viscosity significantly within the given reaction time. In baked goods consisting only of crust, i.e. biscuits, crackers and wafers, the amount of acrylamide formed in the course of the Maillard reaction is particularly high. Among other measures, the addition of asparaginase helps to keep the levels low (Fig. 4). The enzyme converts the amino acid asparagine, a precursor of acrylamide, into aspartic acid (another amino acid), which does not react to acrylamide. The optimization of the dosage of wafer enzymes is simpler than for other baking application. Technically, there is no overdosage, so trials can be run with a maximum dosage. In following trials, the dosage can be reduced stepwise to a both functional and economical level. The water addition rate has to be lowered by approx. 10 percentage points, for instance from 160 parts to 150 parts, because the enzymes release water from gels turning it available for immediate evaporation (Fig. 5, from point (2) to point (1)). Without sufficient reduction, the wafer sheet become fragile (too much raising). The batter should be used only when most of the viscosity change by the enzyme has occurred. For a batter temperature of 22 °C or higher, 10 minutes resting time should be sufficient. Gentle agitation accelerates the approach to the bottom viscosity. This requires an intermediate buffer tank after the mixer. Application of the batter immediately after mixing will not result in satisfying quality. The target viscosity can be determined as usual, for instant by a flow funnel, a slope flow viscometer or a rotating viscometer. In the event of longer standstills, the viscosity of the batter in the buffer tank will be reduced further and causes sticking of the wafer sheets to the baking irons when restarting the production. However, the batter stays usable for about 45 minutes. In case of longer standstills, it should not be used anymore. 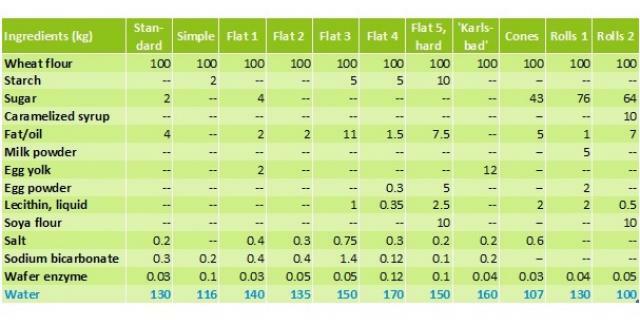 The economic advantage is considerable: 10 kg less water per 100 kg flour represents a reduced baking energy input of about 7 kWh. This will compensate at least for some, if not all, of the enzyme costs. 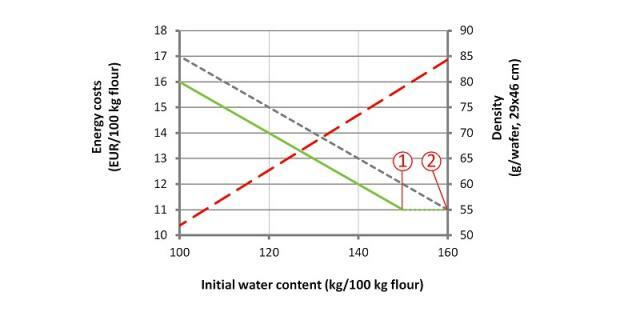 If the water reduction is larger than required to maintain the accustomed flow properties, the viscosity of the batter increases. However, due to the destruction of the gluten lumps and strands by protease, the flow properties of the batter are maintained because the batter does not form uneven ends (long “tails”) when deposited onto the irons. The batter must be deposited evenly onto the irons, and in case of flat wafers, there must be even stripes, without trickling. Since water (vapour) is responsible for most of the leavening of wafer batters, its reduction results in denser and hence more stable wafer sheets with less pores. In some applications, for instance ice-cream cones, the reduced viscosity is beneficial because it limits the water migration into the wafer, maintaining the crispiness for a longer period. Increasing the wafer density will also increase the hardness of the wafers, which is not always a desired effect. Wafer bars, for example, usually have to be soft melting on the tongue. On the other hand, this property of the wafer enzymes offers the opportunity to create new products with a different texture and a longer shelf life. 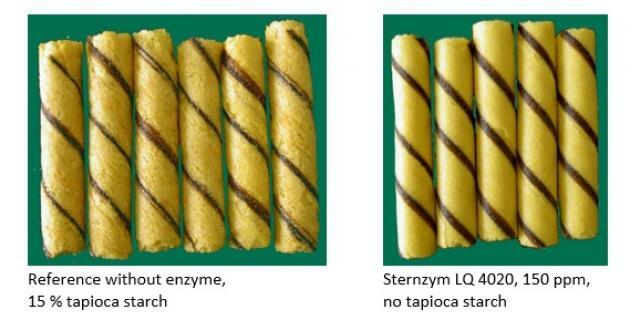 In an example from Indonesia, the situation was more complicated: By the time the trials with the wafer enzyme Sternzym LQ 4020 were performed, tapioca starch sold below the price of wheat flour because the local tapioca crop was subsidized. Manufacturers of baked goods – not of only biscuits, crackers and wafers – liked to add tapioca starch because this reduced the raw material costs. Fig. 6 (left) shows wafer rolls made with 15 % tapioca starch. They were very fragile and unattractive. 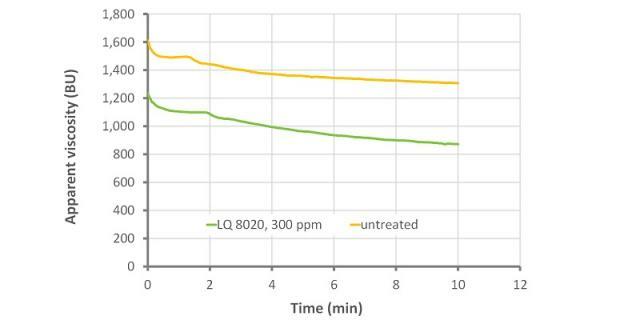 When the starch was replaced by flour and the enzyme was used (at a dosage of only 150 ppm), the quality improved dramatically and product losses where reduced (Fig. 6, right). Since the costs where higher than acceptable for a low-end product, a second, higher-priced brand had to be created. When the subsidies were lifted a few years later, the enzyme-containing formula suddenly became more economic than the tapioca starch-containing version. In flat wafer production, the use of wafer enzymes increases the usable wafer sheet surface, i.e. more bars can be cut out of one sheet, and the rework is reduced. In general, wafer enzymes allow a broader flour quality range to be used in the formulas. Without enzymes, higher gluten contents may cause processing problems. Since the gluten is partially degraded by protease, it does not form lumps. However, higher protein may result in stronger wafer sheets with different eating properties. This short report shows that protease and pentosanase can be applied beneficially in wafer production. They improve the economic situation, increase the yield and make the raw material choice more flexible. Their application is simple, requiring only minor adaptation of the production process. The author thanks Angelika Drakulic for revising the manuscript and her valuable comments.